Bold managers have bench strength. It limits downside. Is your HR department proactive? Come to think of it, pretend you just tripped over it and describe what a proactive HR department looks like to you. How many HR managers have moved into managing other departments in your company? Challenge them to try. 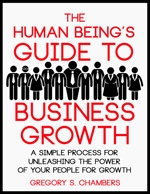 I am in the final stretch of getting my book, “The Human Being’s Guide to Business Growth: A simple process for unleashing the power of your people for growth,” to a publisher and mentioned it to a client. He smiled at me and said, “Oh good! That means I can just give your book to my people and we won’t need you anymore.” We had a little laugh about it. Well, he had a big laugh, I had a little, uncomfortable laugh. It made me stop and think, what exactly is the difference between hiring a consultant and reading a book? That sounded about right. Prep with the book, but then bring in the coach to speed up results. Returning to the office, I took a moment to consider all of the books on my shelves. From there I looked at the dozen books on the desk. Then my gaze drifted down to the box of books on the floor. Books are for ideas, not activity. When we need to expose our brains to new ideas, read a book. Getting results is a different beast altogether. We put them in the same bucket, but they aren’t the same thing. Use books to broaden your team’s thinking, to generate new ideas. However, if you’re looking for action, hire a coach. I had to stop using it when people couldn’t get past, “Who is Columbo?” The close aged out of relevance. Guess what? I was messing with a digital antenna this week and it’s on TV! Some channel called MeTV or something. Maybe I can bring the Columbo close back?!? That thought inspired me to make some comics for you. Don’t say I never gave you nothin’. You’re Going the Wrong Way Which Sales Training, Management Training, Leadership Training is Best?